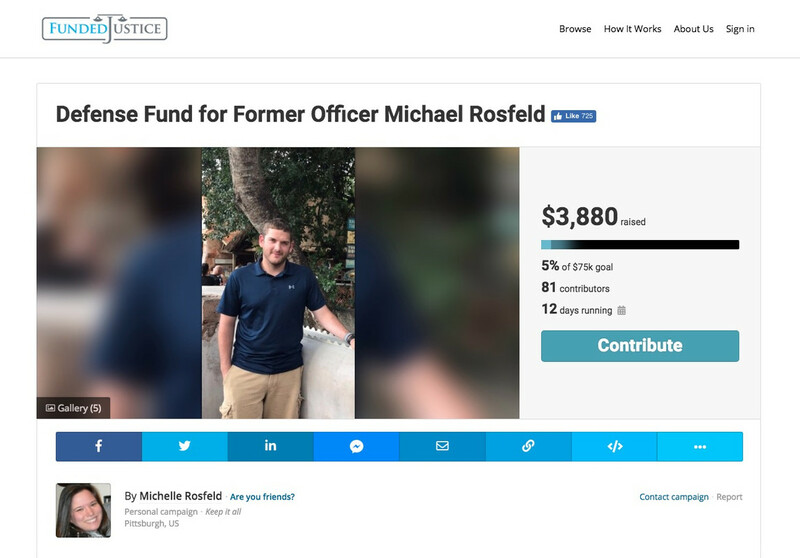 Tue., March 19, 2019 2:21 p.m. | Tuesday, March 19, 2019 2:21 p.m.
An online fundraiser established to help former East Pittsburgh police Officer Michael Rosfeld pay for his defense raised at least $400 during the first morning of his trial Tuesday. The fundraiser on the site Funded Justice appears to have been started by Rosfeld’s wife, Michelle. “Since Michael is no longer able to work, our resources are depleted, and we are in need of financial assistance for his defense,” the fundraiser’s description states. The fundraiser aims to raise $75,000. As of Tuesday afternoon, nearly $4,000 was raised from about 80 contributors. The fundraiser was launched March 6. The trial for Rosfeld started Tuesday. He is charged in the June 19 killing of Antwon Rose II, accused of shooting him three times as Rose ran from a traffic stop in East Pittsburgh. Prosecutors will argue throughout the trial that Rosfeld’s actions were not justified. Jamie Martines is a Tribune-Review staff writer. You can contact Jamie at 724-850-2867, jmartines@tribweb.com or via Twitter .